As I get older, I'm finding that my skin is showing age not so much in wrinkles, but in dull skin. Older skin doesn't hydrate as well, or create as much collagen, or turn over new cells as quickly as younger skin. 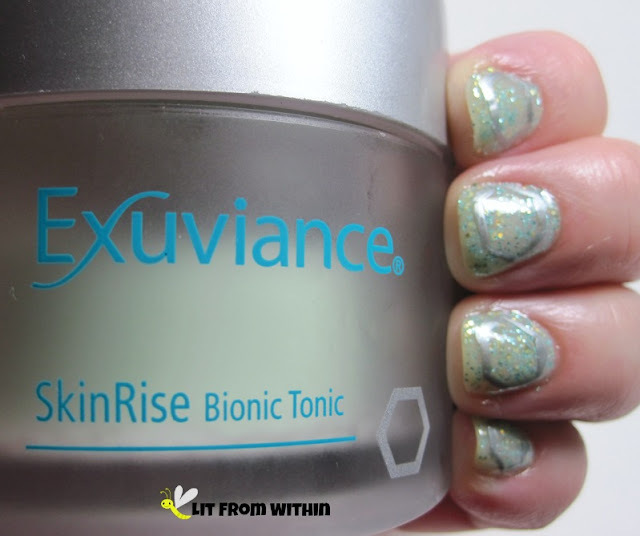 One of my new favorite ways to wake up my skin is with a pad of Exuviance SkinRise Bionic Tonic! I love the name of this product. As a woman of *ahem* a certain age, I can't help think of the Bionic Woman and the Six-Million Dollar Man. I hear the distinctive 'bionic' sound effects from the show as I open the jar. "We can rebuild her. We have the technology." Bionic Tonic is like a multi-vitamin for the skin. Each jar contains 36 individual pads soaked in the tonic that smells like a spa - a little sea salt, a little cucumber, maybe a little floral. It's a light and fresh scent. It's chock-full of antioxidants and Polyhydroxy acids to protect the skin from free radical damage and help the renewal process. I guess you're supposed to use this in the morning, to help 'wake up' your skin. I found that it just didn't work for me in the morning - the serum dries slowly on my face, making it too sticky to put makeup over it. Of course, everyone's skin is different, but it took hours to completely absorb for me. Instead, I enjoy putting it on at night, right after I cleanse my face, but before my other serums and moisturizer. On lazy nights, I can use just the Bionic Tonic and nothing else, and my face feels refreshed and moisturized. In the morning, my face feels soft, and my skin is hydrated. I really like the convenience of the pads. They have enough tonic to cover my face, neck, decolletage, and even my hands, if I want. They are soft and non-abrasive. If the serum came in a pump, I'd use it that way, too. I went through a few days where I stressed out and wasn't taking care of myself or my skin. My face became oily and dull, and I broke out in pimples all over my cheeks and chin. 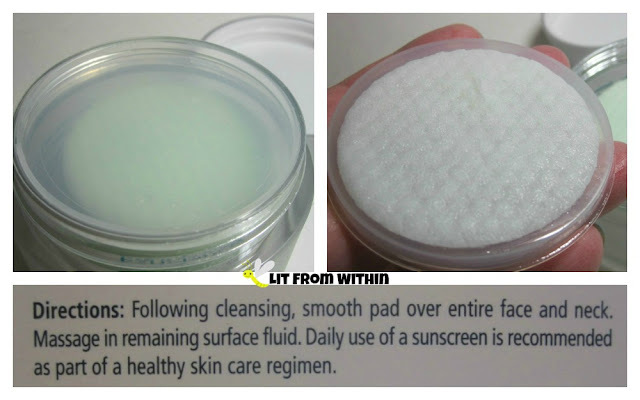 I credit this product for helping my skin get back to normal after that! I don't think it has ever calmed down that quickly before. I would totally recommend these to combat the stress crazies for 'event-ready' skin. A simple Bionic Tonic-inspired nailart! The base is Femme Fatale Lacquer Princess Jas, and I used a silver striper to create the hexagon shape on each nail. For more information, or to purchase, you can find Exuviance/NeoStrata on Facebook, Twitter, Instagram, Pinterest, YouTube, Google+, and on their website, where their SkinRise Bionic Tonic currently retails for $45. How do you like to wake up your skin?